Does sitting on your outdoor patio just not feel like enough? Maybe a nice, cozy fire would help liven things up. With this fire pit package by Hearth Products Controls, you can get the whole deal all in one place. 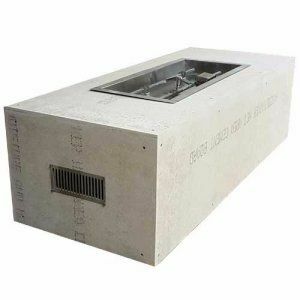 A 60" by 24" enclosure holds a 30" by 12" bowl pan burner that can be easily ignited by a match. Finish the enclosure however you wish, with options like stone, veneer, or stucco, and make it your very own. Never feel unimpressed by your own patio again.